Digital fabrication transforms digital designs into reality. It opens a world of opportunity for students and people to see their ideas come to life. The North Texas Digital Fabrication Group is part of the College of Visual Arts and Design (CVAD) at the University of North Texas (UNT). CVAD encourages creative futures for its diverse student population and the rest of the area. This group was formed to facilitate the free exchange of information on digital fabrication among members of the group. Group members are from North Texas area universities and engaged in some aspect of digital fabrication. The group has connected faculty of various academic levels and shared research interests to educate about new and exciting advancements in the field. In collaboration with the North Texas Digital Fabrication Group, IITTL has had the opportunity to be a part of a few community activities where the public has engaged in digital fabrication methods such as 3-D Printing. For more information on the North Texas Digital Fabrication Group, click here. Members of the Digital Fabrication Group hosted a brief meeting at TWU to discuss future upcoming events, and projects relating to expanding involvement and participation in Digital Fabrication in educational settings. For more information and access to pictures, click here. Dr. Shaunna Smith talked about the incorporation of digital fabrication into education, with elementary and middle schoolers. 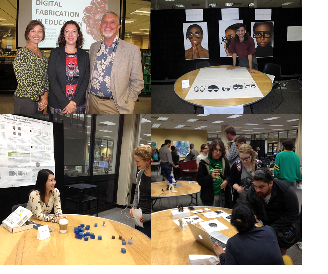 Additionally, a Research Fair featured the capabilities and accomplishments of different digital fabrication software. October 17, 2015 Denton Mini Maker Faire The 2015 Mini Maker Faire was a unique festival where the Denton community celebrated ideas and innovation in the Denton Civic Center from 10:00 am to 5:00 pm. At this festival many had the opportunity to tinker, design, hack, build, reuse, play, think, learn, share ideas and be inspired by science, technology, engineering, arts, food, music and crafts. April 10, 2015 IITTL meets Digital Fabrication Group IITTL members met with the UNT & TWU Digital Fabrication team to discuss digital fabrication and demonstrate 3-D printing models in the Design Research Lab.